Ukrainian army shelling has forever changed the life of a teenage girl near Donetsk. She is now lying in hospital with a shattered arm and shrapnel wounds. The teen saw several people, including children, being killed by falling bombs on the riverbank. 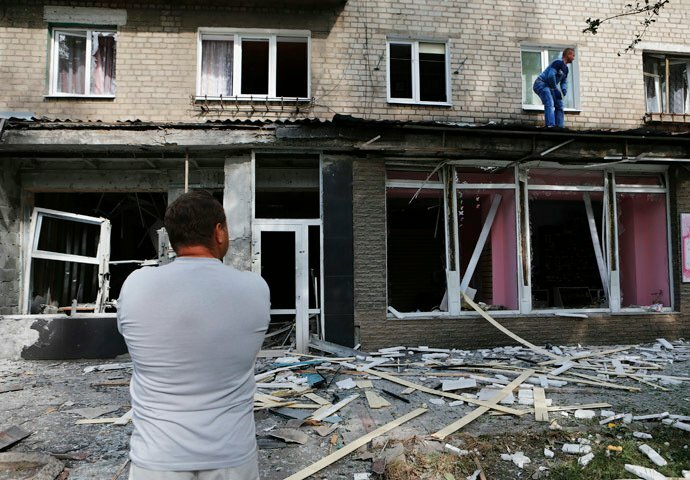 Government forces first bombed the village of Zugres in the Donetsk region of eastern Ukraine on August 14. Several shells hit a beach full of people relaxing by the river, with shrapnel killing 12 people, the Rossiya 24 TV channel reported. Several people were injured and taken to hospital. Yana Fenenko was one of the lucky ones who survived that day. “We were swimming in the river when lots of bombs started falling all at once. We left the water and I threw myself down on the ground. I was lying prone, but I was still hit by a bomb,” 15-year-old Yana told RT’s Ruptly agency from a hospital bed. Yana has been in the hospital for about a week and still has another month to go before she can be released. Doctors say her recovery will be very long and painful because of all the shrapnel in her right hand and the right side of her body. “She has a lot of shrapnel wounds in the right half of the body: the jaw area, all of her right hand, shoulder and forearm, right hip and right thigh,” one of her treating doctors told ANNA News. “My life definitely changed for the worst [since Kiev’s military offensive began]. A lot of my friends and acquaintances have died,” the girl said. Yana was planning to study to become a teacher. She had all the documents already submitted to a local college and was just waiting for the exams, but those have been continually postponed due to the Ukrainian army shelling of eastern Ukraine. Since the initial shelling of Zugres, the girl’s parents have been forced to take cover in a bomb shelter. “They’ve been there for two or three nights already,” Yana said. Yana’s grandmother is with her at the hospital. She said she is devastated by what is happening to her family and land. “I can’t understand this government, or Mr. Poroshenko himself. Why should our kids, our mothers, or grandmothers suffer? There is so much pain inside, I can’t even express it,” the woman said. The Ukrainian military is moving forward with their offensive, carrying out raids in Donetsk and Lugansk as well as the surrounding areas, according to Ukraine’s National Security Council spokesman Andrey Lysenko. Reports from the ground indicate that the offensive continues to be accompanied by indiscriminate shelling of residential areas, causing daily civilian casualties. On Wednesday alone, 34 people died and 29 others were injured as Kiev shelled villages and towns in the Donetsk region, local health authorities reported. 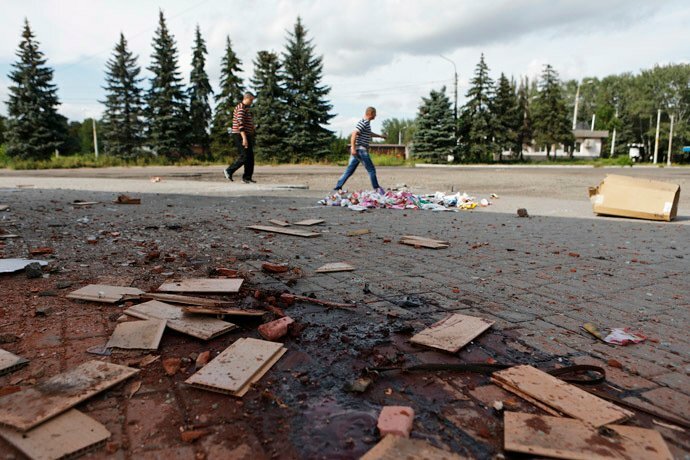 Shells also hit a penal colony in the Donetsk region, killing two inmates, local authorities told RIA Novosti. Another bomb hit the Yasinovskiy coke and chemical plant in the city of Makeyevka, causing fire with a billow of smoke. All of the workers have been evacuated and production at the plant has been halted. Makeyevka has for days been the target of relentless shelling, with houses, kindergartens and a fuel station reportedly destroyed in several attacks. Six civilians were killed there as a result of Tuesday’s shelling. 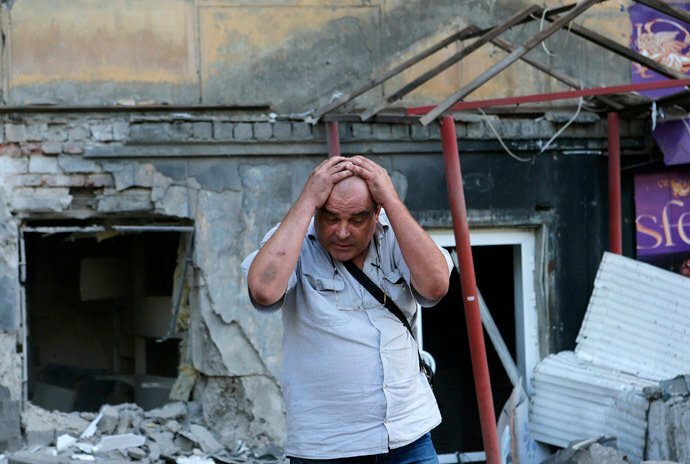 Some of the towns targeted by Ukrainian troops’ shelling are left with no water or electricity. On Tuesday, a water purification plant was heavily damaged in the Donetsk Region, cutting water supplies to thousands of people, including those in Zugres. Meanwhile in the city of Donetsk, local maintenance crews have been working to restore the damaged water plant supplying water to a population of 436,000. Meanwhile, Ukrainian customs officials are refusing to inspect the first batch of Russian trucks carrying aid to eastern Ukraine, claiming that the paperwork is not ready. The UN has estimated that around 2,000 people have lost their lives since the start of the riots in Kiev and the subsequent military campaign in the south-eastern regions of the country.